Parent and child of Tokiyori Hojo made Zen meditation in Kenchoji Temple of Kamakura. Samurais of guard are gathered around the temple. There is being heavy security. In the facing of parent and child, there is Doryu of the Zen priest who wore a black robe. There is Doryu of the Zen priest who wore a black robe among facing parent and child. Doryu was called Rankei, as virtue priest invited from Sung. He came from Western Shu (present-day Shichuan Province, China) of the South Sung dynasty. He made a voyage to Japan with a disciple at the age of 33 years old and he went to the capital Kyoto the next year and entered the Invited Place of Senyuji Temple. 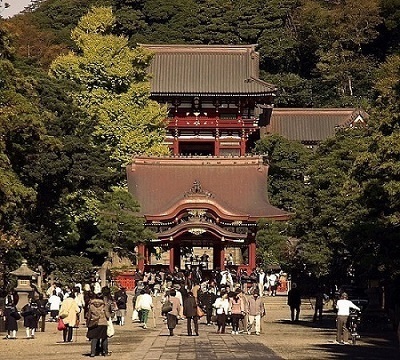 Furthermore, he visited Kamakura and was in Juhukuji Temple and Jorakuji Temple, and he was invited and was nominated as the founder of Kenchoji Temple and he received faith from Tokiyori Hojo. Tokiyori as already far from the regent's post, but he is a direct descendant of Hojo continuing from Sanetoki and Yasutoki. The power overwhelmed others. He puts it under the control of it even in the Imperial Court. The reason was 'the Revolt of Zhokyu' that Gotoba ex-emperor rose the soldier who subdued the second regent Yoshitoki Hojo of the younger brother of Masako Hojo of the wife of Yoritomo Minamoto in 1221, but he was defeated in the war. As a result, Yoshitoki performed Gotoba ex-emperors banishment to Oki island, and the Emperor Juntoku banishment to Sado island, on the charge of a rebellion. In addition, the Tsuchimikado ex-emperor who was the first prince of the Gotoba ex-emperor advanced in spite of being innocence by oneself and was sentenced to banishment to an island of Tosa. After this, the Kamakura Shogunate will establish Imperial Court rule. In this sense, the regent of the Kamakura Shogunate was said with the emperor in Japan in effect. A Zen priest holding a stick stands behind parent and child. At first Tokisuke of the eldest son was hit his shoulder. He glares at a Buddhist priest unintentionally. Tokimune was beaten next. The reaction of Tokimune is different from the older brother.He knew failure, but closed his eyes calmly again. “Because you two are young, a mind changes, are not you?". While father Tokimune closes his eyes, he talks. “Hum, is it possible for the noble bonze, you, to read the mind of two children?”. "Sir Tokisuke looks rebellious to Sir Tokimune. He has a thought that he not want to be defeated by the younger brother vividly”. "Hum, how about a younger brother?". "It will be the future of the father". "Who will become a leader of Kamakura after Sir Tokiyori? Tokisuke of the older brother is dominant with the number of ages, and I am superior with the ability". "Priest Doryu, you say too much!" Father stopped an older brother. "Wait, and wait. The guess of the chief bonze is mixing the supposition. It is teachings of the Zen Buddhism not to disarrange a mind in such a thing." A smile played on Doryu's lips. While Tokiyori closed his eyes, he heard it. "Then the chief bonze, is my mind readable?". Doryu was lost in thought. "Is it not recent natural disaster and famine?". "Do you see it like that?". "The Kamakura Shogunate is thought to be stable now. Accordingly, as for Lord Tokiyori, it should be anxious about improvement of domestic administration from now on. However, is it not anxiety when even Lord Tokiyori cannot stand starvation, an epidemic, extraordinary phenomena?". "I am thinking about you, the chief bonze. You are the noble Buddhist priest who came expressly from China. Our Japan thought that the trade with China was important and we maintained the port of Kamakura. However, it is possible because politics of China is stable. China is being threatened by the northern savage tribe now." Sweat broke out on Doryu's forehead. “The reason that built this temple is because you are the Chinese superior well-informed person. I want to hear various information. I think that it is not to become the loss if you want to spread Zen Buddhism in this Japan”. "It does not become very as good as expected. In Japan, Nembutsu sect of Buddhism occupies most now and there is the priest attacking every denomination including our Zen Buddhism in Kamakura now." "It is a priest called Nichiren probably." "There is uneasiness to me in the diplomacy of other country across sea. For a chief bonze, there is worry to the priest who is called Nichiren of Kamakura of your ground”. On the eighteenth day of the intercalary first month of the fifth year of Bun’ei (1268), an official letter arrived from the great Mongol empire in which those barbarians of the west declared their intention to attack Japan. My prediction in On Establishing the Correct Teaching for the Peace of the Land, which I wrote in the first year of Bunnō (1260), cyclical sign kanoe-saru, has been fulfilled to the letter. My admonitions have surpassed even those set forth in the yüeh-fu poems of Po Chü-i, and my prophecies are not inferior to those of the Buddha. Can there be anything more wondrous in this latter age? If our land were governed by a worthy ruler or sage sovereign, then the highest honors in Japan would be bestowed upon me, and I would be awarded the title of Great Teacher while still alive. I had expected to be consulted about the Mongols, invited to the war council, and asked to defeat them through the power of prayer. Since that did not happen, however, I sent letters of warning to eleven of our country’s leaders in the tenth month of the same year. If there were a worthy person in this country, he would immediately think, “What a wonder! This is surely no ordinary matter." In actuality, however, priests of the other schools cursed and deceived my messengers. The government officials ignored or refused to reply to my letters, and even when they did reply, they deliberately neglected to report the content of my letters to the regent. However, in fact priests of the other sects cursed my messengers and deceived, and ignored or refused to reply to my letters, and even when they did reply, they deliberately neglected to report the content of my letters to the regent"
Their behavior was highly irregular. Concerning the “peaceful” practices of the Lotus Sutra of the Wonderful Law and the practices carried out by Nichiren and his followers now in the Latter Day of the Law, you should understand that, when one practices the Lotus Sutra under such circumstances, difficulties will arise, and these are to be looked on as “peaceful” practices. In the Latter Day of the Law, Nichiren and his followers will encounter adversity when they practice Myoho-Renge-Kyo, but they should understand that actually, it is peace and pleasure. This refers to the third of the three powerful enemies who persecute the votaries of the Lotus Sutra, men like Ryōkan.